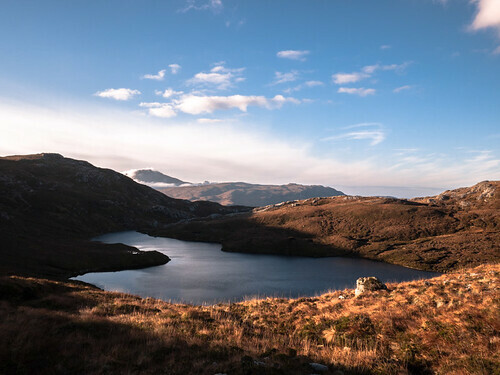 The Inchnadamph hamlet, at the head of Loch Assynt and directly below Conival, and Ben More Assynt, lies in a limestone depression that is an intrinsic part of Assynt's fascinating geology and (very) ancient history. It is also a departure point for a number of excellent runs, whether it is something short and fast you are after, or whether you are in the mood for remoteness and solitude, or whether you are just interested in some stunning views. A short run along an excellent rocky path (or stream when raining! ), taking you into a lovely coire; worth doing even if just passing through the area. Set off from the car park near Inchnadamph Hotel, along the road (N) to cross the river, then turn right (E) along an access track passing a Youth Hostel on the left. At around NC 259 220, a path turns left (N) from the track heading up the hill side. Follow this path all the way to the foot of the loch and back. 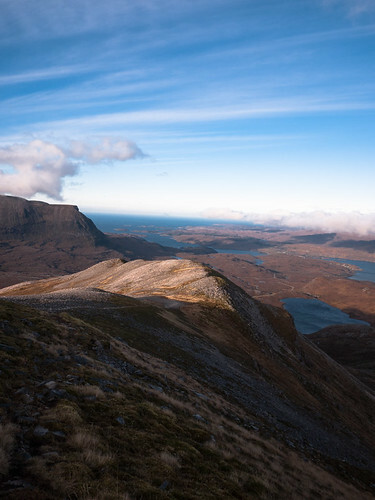 This run ventures into some of the most remote-feeling land in the whole of Assynt, surrounded by eerie cliffs, offering splendid views of Loch Beag and Loch Glencoul, and passing near the tallest waterfall in the UK. And all this on a route that is runnable in its entirety! Good navigation skills are, however, essential. Start as for the Loch Fleodach Coire run. Around NC 274 240 the path splits (near a small stalker's shelter), take the right fork heading NE along Allt Tarsuinn all the way to Loch nan Cuaran. Contour the W bank of the loch to its head (N) and then take the shallow gully N aiming to pick up the path that starts around NC 289 242. This is an old, hand-built, pony track, that provides excellent running. The pony track peters out for a bit on the plateau, as it curves to NNW direction, but you should be able to pick it up again as it drops of the plateau at its other side, heading toward the two unnamed lochans at NC 289 254. At the lochans the path becomes again less obvious, and it is tempting to just head down the obvious NW shelf -- don't. Instead, the pony track turns sharply right, heading in SSE direction (as clearly shown on the map), taking an easy route through the broken rocky hillside. Take care to locate, and stay on, the pony track, as there are no viable alternative descents. While pondering who built the path and how much effort it must have been, follow the pony track to the three way junction at NC 295 259 then carry on along the path heading in NW direction. Follow this rising traverse to the unnamed lochan at NC 280 270. From here pick up the path heading into the bealach between Glas Bheinn and Beinn Uidhe (NC 265 262). Descend on the same path the other side of the bealach to Loch Fleodach Coire. The descending path is quite faint and hard to follow. As shown on the map, it stays on the E side of the coire rather than cutting down into it, that's where the ground is best whether you can follow the path or not. In any case, the path is easily picked up again once at Loch Fleodach Coire; follow it back to start. 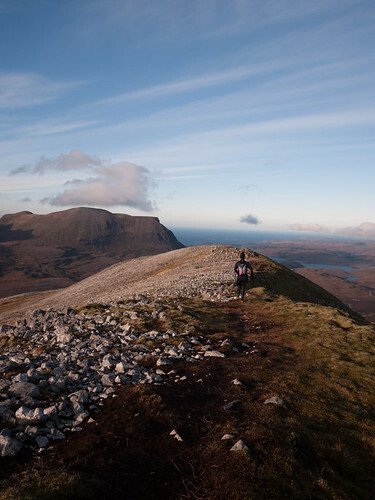 If views are what you are after, then the summit of Glas Bheinn will not disappoint, offering the best possible view of Quinag, and of the lochs around Kylesku. Start as for the Loch Fleodach Coire run, but continue on the path all the way to the bealach between Glas Bheinn and Beinn Uidhe (NC 265 262). From the bealach head W up the rocky ridge on a path (not on the OS map), and then to the summit cairn over the open plateau. From the summit descend initially along the NW ridge on a walkers path. This turns down the W slope onto the low level path that runs parallel with A894, marked on OS maps (it is possible to descend at the N end of the ridge, on some very steep grassy and heathery ground, but this is not recommended). Once on the low level path, take it S to A837 and return along the road for the final 2km to the start. Breabag is a quartzite ridge that forms the backdrop you see when looking E from any of the iconic Assynt hills. 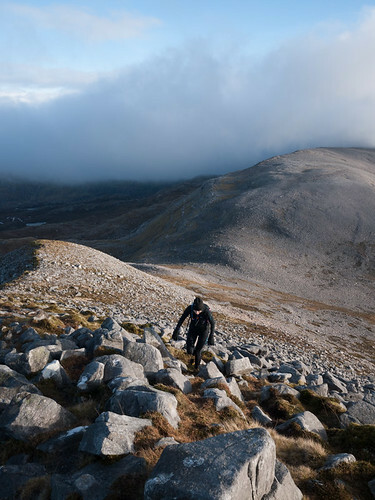 The ridge proper is not the easiest to run on -- most of it, but particularly the narrow segment between the three lochans, is a heap of angular quartzite blocks of varied size. More so, the quartzite is positively lethal in the wet. However, the lower parts of this run make it possible to explore the limestone basin, with its caves and underground streams. The natural start of the run is at the small car park for the bone caves / fishery just off A837 (NC 253 179). 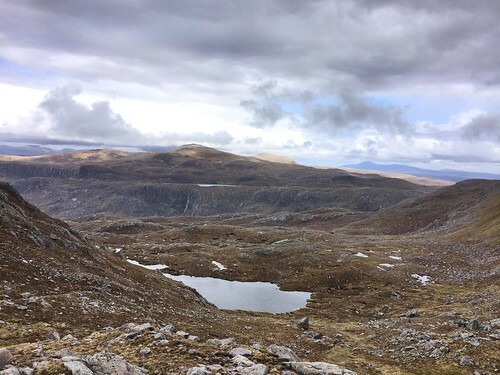 The circular route described here involves 4km on the A837 road between Inchnadamph and the fishery; whether you choose to start or complete the run on the road, is, of course, entirely up to you. Follow the path for the bone caves running parallel to Allt nan Uamh (this stream, like several others in this area, disappears at times underground; the section between where the path marked on the OS map forms a loop is underground). When the path splits (NC 266 173), you can follow either fork, but the caves are worth a passing visit, and the higher path is easier to run on as well. Either way, you eventually want to follow the S bank of Allt nan Uamh from beyond where the path loop ends up to where the first tributary marked on the OS map comes in from ESE (NC 273 170), and then follow the tributary up to below Fuarain Ghlasa. The rock band that separates the upper and lower parts of the hill is more pronounced that the OS map would suggest, but is passable without major difficulties in the vicinity of the stream. Once above the rock band, head for the S summit (815m). difficult near the lochans. The raised pass between the three lochans is a somewhat demoralising heap of large quartzite blocks. Fortunately, the difficulties ease off a little on the ascent to the N 718m summit. 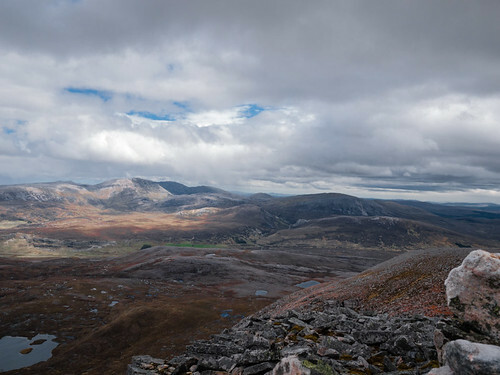 From there continue along the ridge, which curves E above the Breabag Tarsainn outcrops, descending into the lairig between Breabag and Conival. Head into the lairig in NW direction, almost immediately picking up a stalkers path (not on the map) along the N bank of Allt a' Bhealaich. This path contours at a gentle gradient along some flatter ground on the SW slope of Conival, while the stream drops into a deep cut below it. Follow this path as it eventually descends back toward Allt a' Bhealaich where the stream emerges out onto a flatter ground. Follow Allt a' Bhealaich, which after a short distance disappears underground, and then the dry river bed, clearly visible and providing good running. At around NC 277 203 pick up the path marked on the OS map and follow it past some more caves, eventually crossing river Trailigill on a wooden foot bridge; at this point, you might want to make the very short detour along the river, to watch it disappear under ground. Descend down to Inchnadamph along the path which shortly turns into a landy track. Conival and Ben More Assynt are the two tallest hills in Assynt, and the only two Munros in this area. The upper part of these hills is essentially a heap of loose, blocky, stones of varied size. These provide a good sport running on, but might not be to everyone's taste. Additionally, the Munro baggers path from Gleann Dubh up to the bealach between Conival and Beinn an Fhurain (a Corbett), is badly eroded. A good outing involving some scrambling can be had ascending into the lairig between Conival and Breabag by reversing the Allt a' Bhealaich route described in the Breabag outing above. At the SE end of the lairig, a broad, almost man-made looking ramp raises up toward Garbh Choire. Take this and continue contouring below the SE ridge of Conival, then ascend the ridge from its E end. As the ridge narrows, it turns into a proper scramble -- not particularly difficult, but at places exposed. Descend from the Conival summit, after detouring to Ben More, via the walkers path and Gleann Dubh.